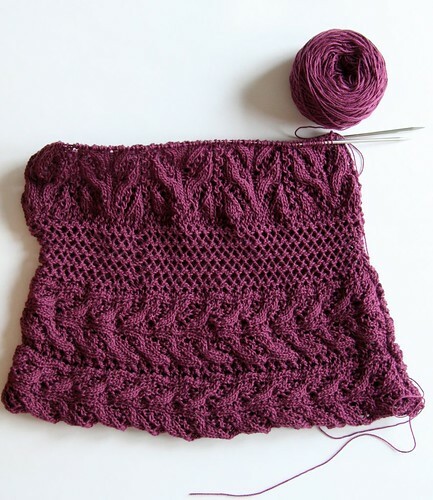 When last we checked in on the Wakame Lace Tunic, it was a scarf-like band of lace that was taking me forever to knit. Since then, I’ve finished the bottom band and joined it with a three-needle bind-off, picked up stitches, and begun working the body in the round. 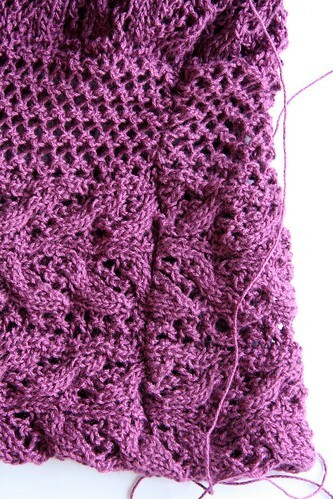 I’m happy with the way the lace looks (would be nice if I could photograph it in focus), and I enjoy knitting it in the round much more than I did knitting back and forth on straights. 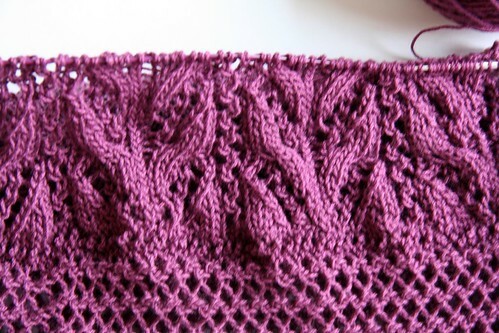 I’m sure a lot of it is to do with being able to read the lace better now, as well as having memorized the chart. The three-needle bind-off doesn’t look as terrible as I thought it would. Actually when it’s stretched out (as it will be when it’s blocked), it looks pretty neat and clean. I’m learning a lot of new construction techniques with this project, so it’s quite interesting and enjoyable. Since taking these photos I knit another body repeat and am getting close to where I would cast on for the sleeves. I’m looking forward to seeing how that works. 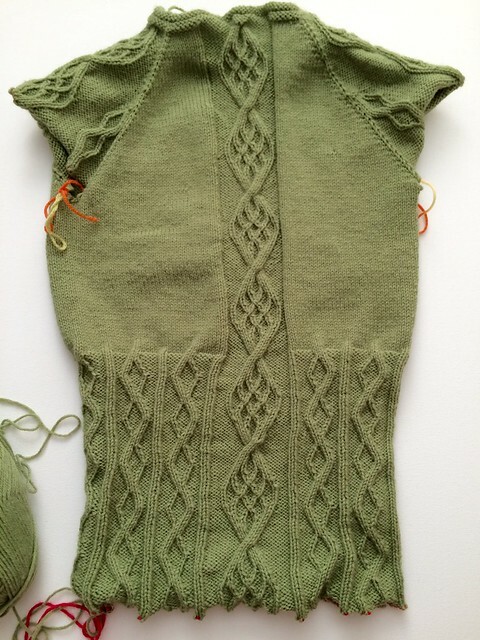 I want to have this tunic finished by the end of March (for a KAL, yes), and while I know it’s hypothetically possible, I don’t know if it’s likely. I guess the only thing to do is knit and see. 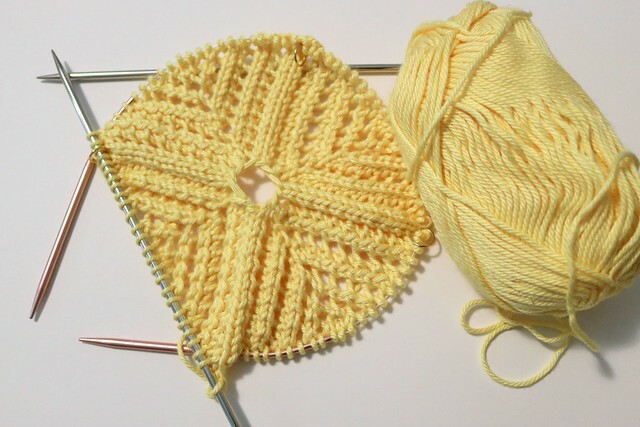 When I first started knitting, casting on a new project was an event. 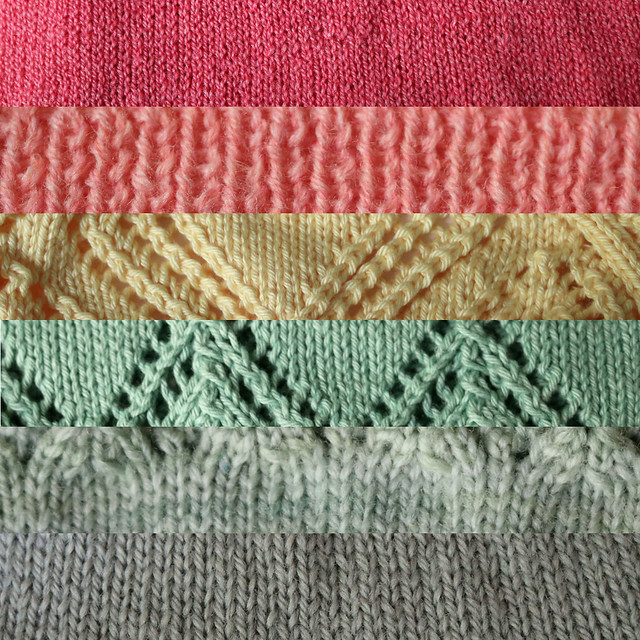 I put so much time and thought and energy into it, and I was so excited by the time I started that I couldn’t wait to take photos and document it, even if all I had to show was a few rows of a sock toe or the beginning of a sweater back. I was worried that I was getting blasé about it, that starting a new pair of socks when I had so many already on the needles was becoming old hat (I’ll address my rather alarming WIP problem in another post). 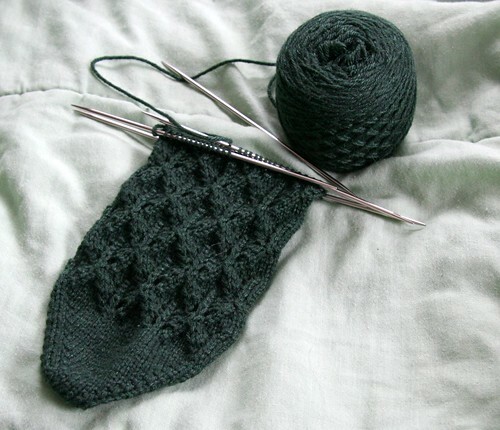 The typical prompt for me to cast on new socks is the Sock Knitters Anonymous Sockdown challenges on Ravelry. This is such a fun, vibrant, and active group that it makes it utterly compelling to participate, and it’s extraordinarily satisfying to finish a pair within the group’s (very generous) timeframe. The February Sockdown challenge included an option for Underappreciated Patterns, which of course intrigues me, as a big fan of the obscure and less recognized. I kept wondering what makes one particular pattern skyrocket in popularity while another equally beautiful (or perhaps even more beautiful) one gets overlooked. 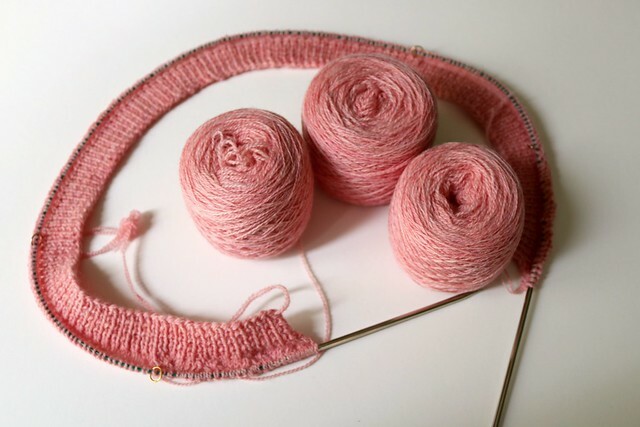 In most cases, I realized that I personally overlook patterns which are photographed in a way that obscures the details (blurry, too dark or light, too far away to see the pattern etc) or, far more commonly, where an overly busy yarn is used. 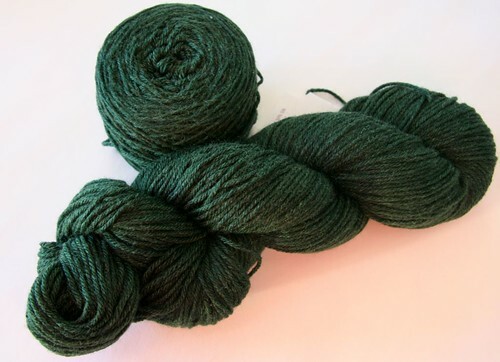 I think some hand-painted yarns are truly works of art, but not all yarns are suited for all patterns, and it drives me nuts when a great pattern is completely obscured by a high-contrast, crazy variegated yarn. Or, when such a yarn is forced to fight with a pattern rather than used in a simpler way that showcases its unique qualities. All these obsessive issues of mine aside, I am pretty confident that the reason this pattern is underappreciated is because it is written in German. 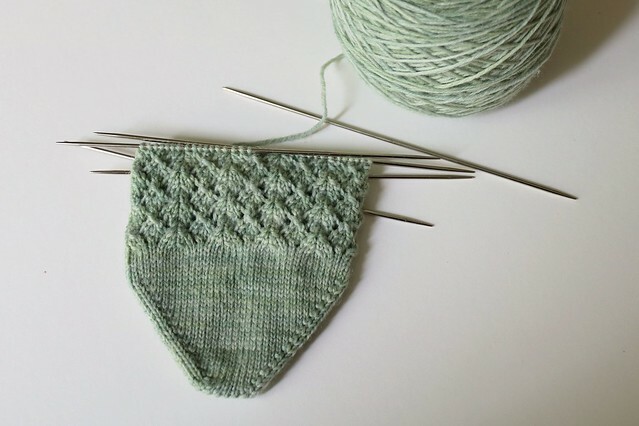 I of course don’t know any German, but I found the photos of this pattern so lovely that I really needed to make a pair of these socks, and I had this green Gloss yarn just begging to become fern lace. It turns out it’s rather remarkably easy to figure out a German pattern, especially one such as this, which has the lace charted out. I found this super-helpful website which translates common German knitting symbols, and combining this with Google Translator, I pieced together the stitch count and instructions. I’ve finished the first sock already, and I’m pretty stoked with the way they are coming out. More to the point, I’m actually enjoying the process, each component, and the whole experience of knitting. It’s a lovely change of perspective.